When it came time for Melbourne based crane hire business Skylift Crane Services to expand its fleet, the company looked to Tadano for a solution and found the perfect fit in the Tadano ATG220G-5 all-terrain crane. Skylift's latest addition to its fleet, the Tadano ATF220G-5 at work in a suburban Melbourne. Established in 1997, Skylift Crane Services is a family owned and operated business offering cranes for hire ranging from a 2.5-tonne crawler crane up to a 220-tonne all-terrain crane. Craig Meredith from Skylift Crane Services says the company has been looking to expand further into the next category of lifting, which is over 200 tonnes. "The over 200 tonne sector opens up an entirely new range of work opportunities," he says. "With the right crane in our fleet we would be able to pitch for work with bridge construction, chiller replacement, high rise works and so on." The company did some research but realised its initial brand of choice held little re-sale value both in Australia and overseas. "This forced us to take a whole new look at cranes in this category," Meredith says. "We were prepared to invest heavily in new plant, but needed to know that there would be a willing global market when the time came to trade out." Through recommendations from colleagues in the industry, Skylift Crane Services was introduced to the Tadano ATF220G-5 crane which fit the brief perfectly. "What we saw convinced us pretty quickly that this crane was perfectly matched to our needs and that the Tadano brand is in demand worldwide," Meredith says. The Tadano ATF220G-5 is a 5-axle crane with ratings of 12-tonne per axle, has full hydraulic suspension, 85 km/h road speed and 69 per cent grade ability. Using the single cylinder telescoping system, the six-section boom extends to 68m. Additional boom extensions are available from 13.2m to 37.2m. Another key feature of the ATF220G-5 is the Asymmetrical Outrigger Base Control function which helps to enhance the machine’s load capacities when the outriggers differ in length. With the system, the length of all four outriggers is automatically determined via length sensors and the position of the superstructure is ascertained via the angle of rotation. Subsequently, both figures are communicated to the crane control system which releases the maximum possible lifting capacities for each single outrigger sector separately. "The Tadano features that appealed to us were the lifting chart which proved superior for radius work; and the efficient transportation of accessroies," Meredith says. 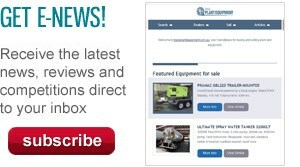 "All-terrain cranes in this category need four semi-trailers to carry the counter weights and the jib. The Tadano only needs three making it 25 per cent cheaper to transport the accessories to the work site." 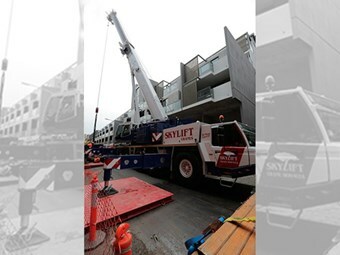 According to Skylift Crane Services, the Tadano ATF220G-5 is able to access locations six-axle models could not, and has worked well in the narrow streets of Melbourne’s inner suburbs. The company adds the height and reach of the jib with full length fly attached has delivered the reach to lift jobs between one and three tonnes to maximum height. "We’ve been impressed by how simple the Tadano ATF220G-5 is to operate," Meredith says. "What we needed was a quality crane that is simple to operate, efficient and reliable and that is exactly what the Tadano ATF220G-5 has delivered for us."